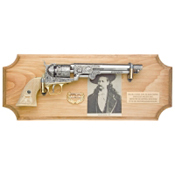 Deluxe Wild Bill Hickok Framed display Gift or Collectors Set: Our handsome frame set depicts Wild Bill in 1873 and features a non-firing replica of his famous 1851 Navy nickel-plated revolver. This replica gun has simulated ivory-checkered embossed grips. Wild Bill carried two of these Old West Pistols throughout the frontier. A U.S. hatpin, brass identification plaque, and custom bullet hangers that allow the pistol to be removed from the wood frame complete the set. Frame is 18" x 7"